VATICAN CITY (CNS) — Truly celebrating Easter means allowing Jesus to triumph over personal fears and give life to hope, creativity and care for others, Pope Francis said. Easter is “an invitation to break out of our routines and to renew our lives, our decisions and our existence,” the pope said during the Easter Vigil March 31 in St. Peter’s Basilica. 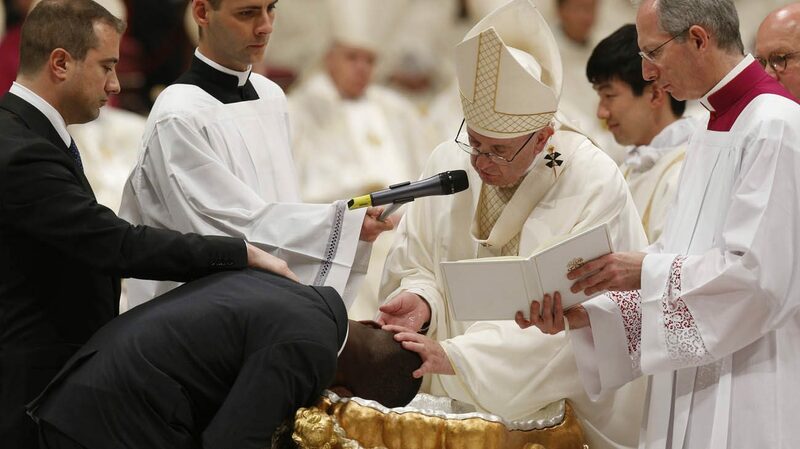 During the liturgy, Pope Francis baptized eight adults, who were between the ages of 28 and 52. The Vatican said Nathan Potter, who was born in 1988 and comes from the United States, was one of the eight. Four of the other catechumens were from Italy and one each came from Albania, Peru and Nigeria. The Nigerian, 31-year-old John Ogah, became a hero last year in Centocelle, a neighborhood on the outskirts of Rome. Ogah, who had been begging outside a grocery store, stopped a machete-wielding thief who had just robbed the store. Once the police arrived, Ogah left because he did not have legal permission to be in Italy. Police tracked Ogah down to thank him and ended up helping him get his Italian residency permit. Capt. Nunzio Carbone, the officer in charge, was Ogah’s godfather and sponsor at the papal liturgy. Pope Francis also confirmed the eight and give them their first Communion during the Mass. 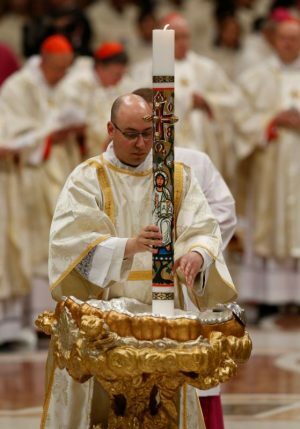 The Mass, on a very rainy night, began in the atrium of St. Peter’s Basilica with the blessing of the fire and of the Easter candle. With most of the lights in the basilica turned off, Pope Francis and the concelebrating cardinals, bishops and priests processed in darkness toward the altar, stopping first to light the pope’s candle and then those of the concelebrants and faithful. Transitioning from the Good Friday commemoration of Jesus’ death and commenting on the silence of Holy Saturday, the pope spoke of the hours when Jesus’ followers are left speechless in pain at his death, but also speechless at the injustice of his condemnation and at their own cowardice in the face of the lies and false testimony he endure. “‘He is not here … he is risen!’ This is the message that sustains our hope and turns it into concrete gestures of charity,” the pope said. It is a call to revive faith, broaden one’s horizons and know that no one walks alone. “To celebrate Easter is to believe once more that God constantly breaks into our personal histories, challenging our conventions, those fixed ways of thinking and acting that end up paralyzing us,” he said.